The need for innovation in this age of rapid change is paramount. The clichés of “thinking outside the box” and “breaking traditions” are well worn. How do we ensure that innovation can still be an exciting process instead of a requirement? With games and play providing a unifying structure, a compelling approach and, most importantly, a fun experience, our innovation experience guides you through the process from initial ideation through roadmap setting, as well as to inspire cross-disciplinary collaboration and dialogue. Our expertise in design-led innovation and our unique interpretation of the role games can play in the innovation process makes us the ideal partner for your innovation journey. Our pre-workshop preparation work customizes a rundown for your purposes; our end-to-end vision places focus on the entire innovation process from ideation through roadmap setting; our facilitation experience ensures an outcome-driven session. 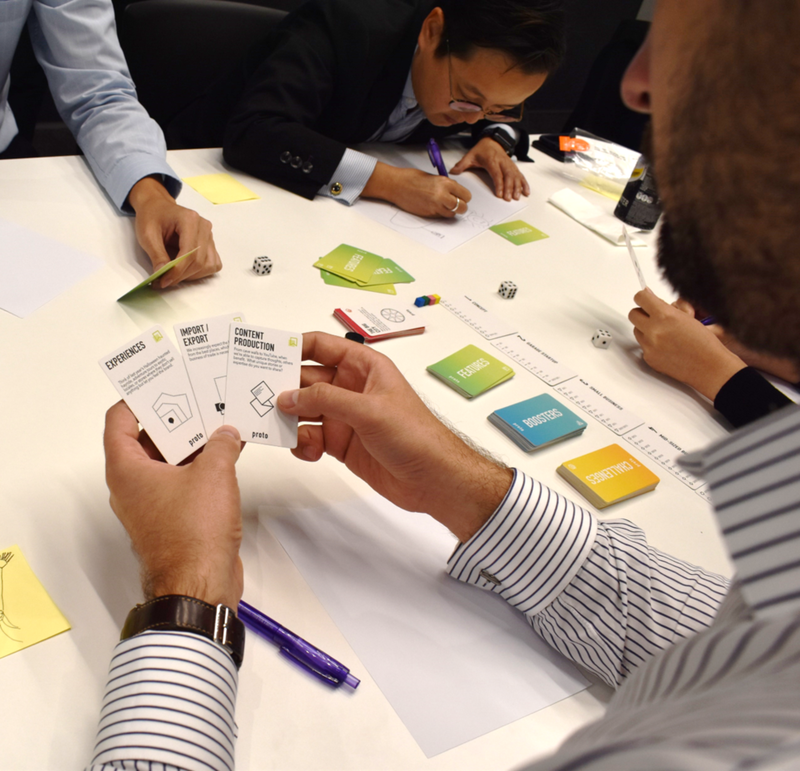 Business strategy, customer centricity, continuous innovation and iteration – the design thinking cycle through a game about co-creation. The creative storytelling card game Proto – designed by Let's Make Great, and co-designed and exclusively distributed in Hong Kong by Press Start Hong Kong – forms the basis for an illuminating creative experience. You helm your own startup with your own users, features, boosters and challenges, putting you in the driver’s seat and forcing you to think critically for the good of your customers and the future of your business – and you need to convince your peers of your vision. A bite-sized introduction to design thinking, with a focus on design doing. The most effective way of picking up the essences of design thinking is to dive in and practice it immediately. With our game-based approach, we introduce the basic concepts of user-centric design, which are fully reflected in the game session. Following an exciting game session, we present how we translate the four pillars within Proto into a unique interpretation of design thinking. All within two hours. Our clients include Natixis, Microsoft and New World Group. Taking the hackathon format and adding a game-like twist to it. We start the day with a round of Proto, customized to industry and business context, as an ideation session to converge on compelling ideas per group. We embark on a deep dive into empathy maps, proposition storyboards and feasibility frameworks to prepare participants for a pitch round at the end of the day, and to get the draft ideas on their way towards a basic implementation blueprint. Check out our video highlights from our cross-industry Innovation Hackathon with Pinsent Masons and Chun Wo. To add to the Innovation Hackathon format, we also plan, curate and host Innovation Offsites. These are an expanded version of the Hackathons, with panels featuring industry leaders and innovation champions who will share insights and case studies. We take care of the entire experience, from venue sourcing to F&B arrangement, from custom game design and production to workshop facilitation, and from speaker outreach to content curation. Check out our extended video highlights from our pioneering cross-industry Innovation Offsite with Pinsent Masons and Chun Wo. For teams and companies who are more advanced in design thinking adoption, we offer comprehensive programs aimed towards incubating ideas and readying them for implementation and roll-out. After the initial ideation session, we work with our array of strategic partners on user research, prototyping and experience mapping en route to blueprint development. The outcome will be a project idea ready to be taken to the next level. Our extensive industry experience in design thinking, innovation strategy and program management ensures that we are a trusted ecosystem partner.